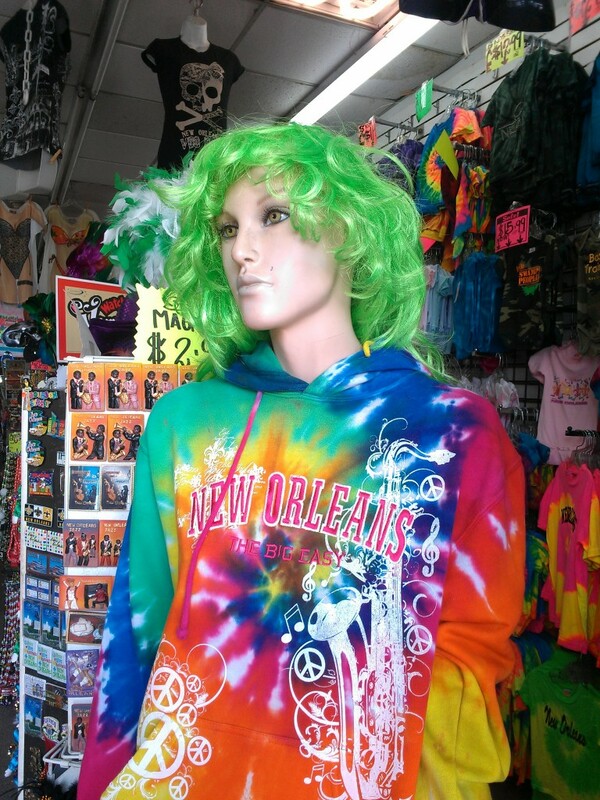 This is the last post chronicling our New Orleans trip. 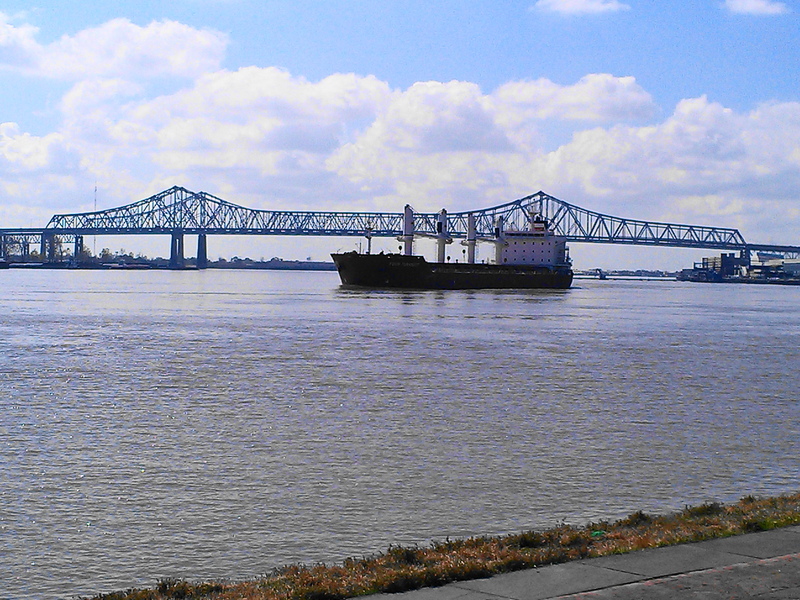 The first thing we did was walk down to the water and watch the ships. Since these posts began with a Mark Twain theme, I decided to end that way as well. 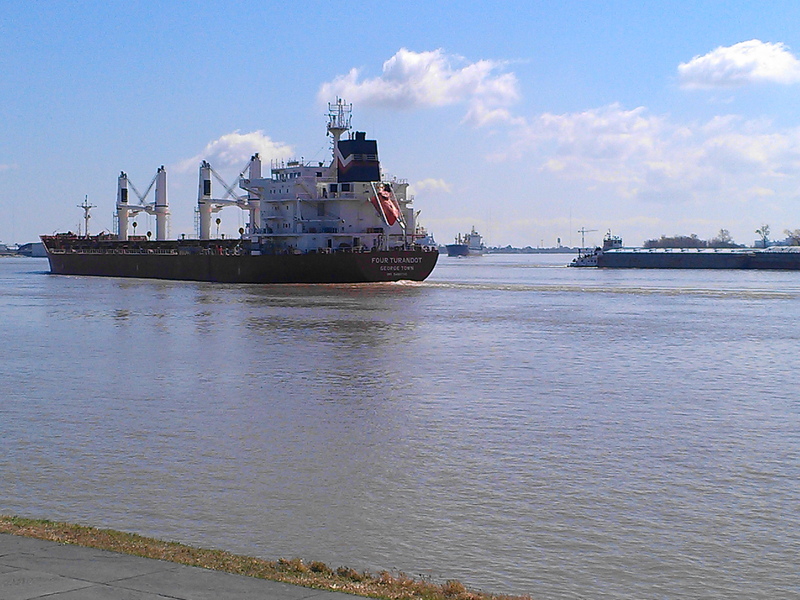 Modern day life on the Mississippi. Lagniappe has been a favorite word of mine for a while, so here is something a little bit extra for today. Actually, this post is more of a hodgepodge. This is absolutely the first picture I took in NO. I could bore you with the family-dynamic-reasons for me wanting to text a green wig pic to my sis, but it would take too long and probably lose a lot in translation. 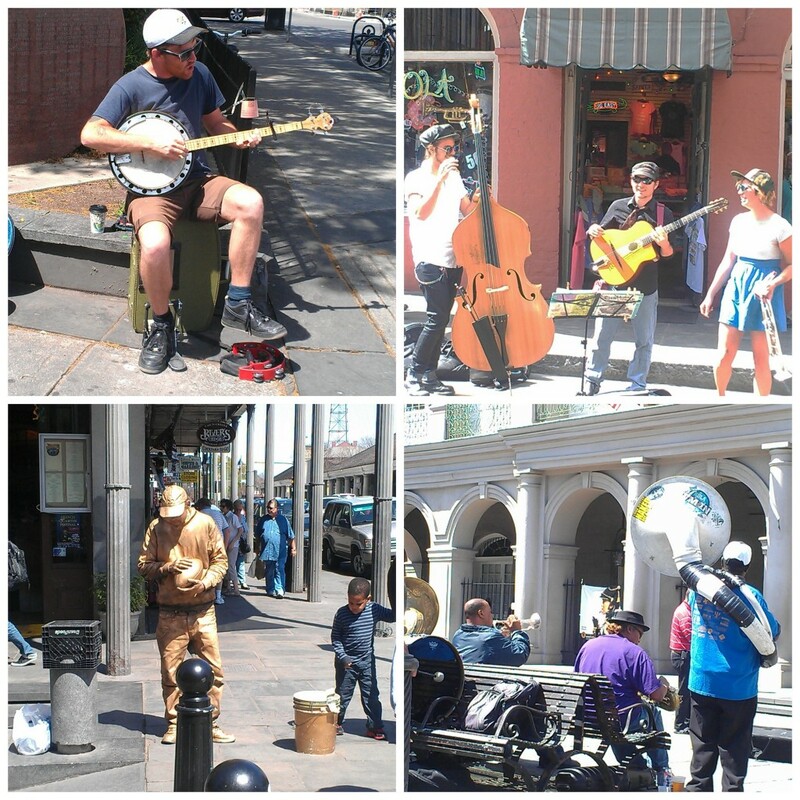 We watched Treme so some of the things I wanted to experience were the street performers. I have always been fascinated with the ghostly haunts and cemeteries. 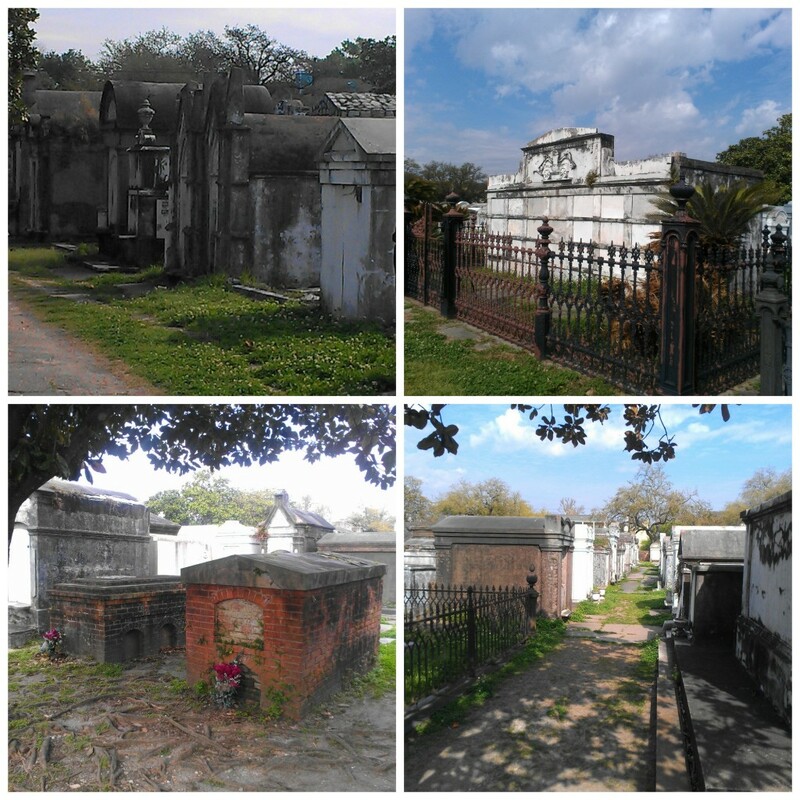 We didn’t do a ghost tour, but I did get The Hubs to walk through Lafayette cemetery with me. I just can’t really fathom the history of this place. Strangely enough, as I went to take a would-be lovely (and eerie) picture of a tiny fern growing on the outer wall of the cemetery, my camera locked up and died. Were the spirits restless? “How are we going to march that way? On the side walks?” I asked. Our hotel, you see was right on Canal Street. The Hubs was a bit perplexed by this too. 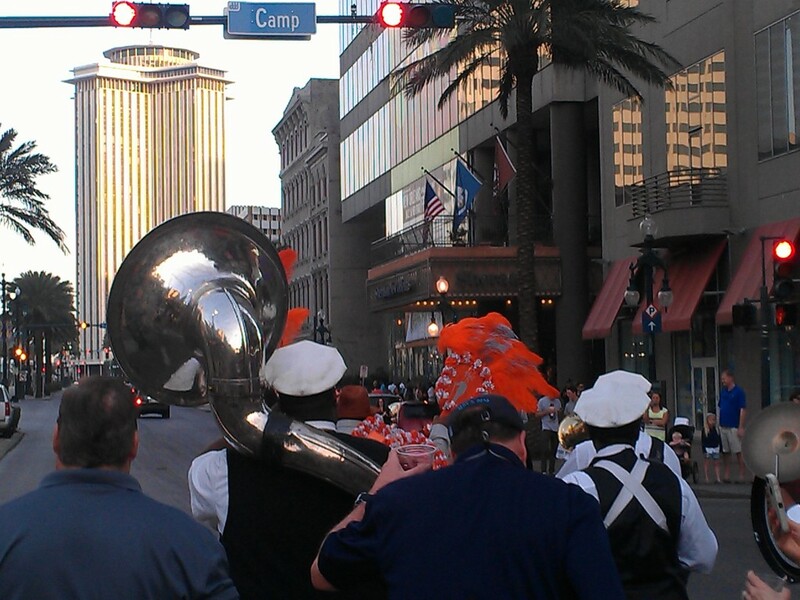 We all (about 100 of us) met in the lobby and soon a brass New Orleans jazz band showed up. 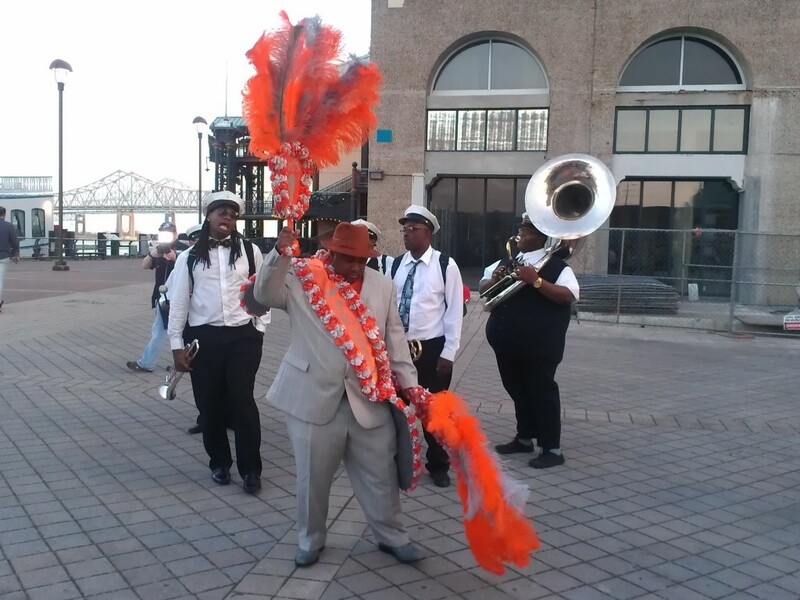 They were the best in New Orleans, according to the event coordinator. They were good. After about three songs, they started leading they way. They stomped out the front doors, turned right on Canal St. and had the right-of-way. This is how we were able to parade down Canal St.
A New Orleans police officer blocked traffic and we were escorted by a motorcycle officer. 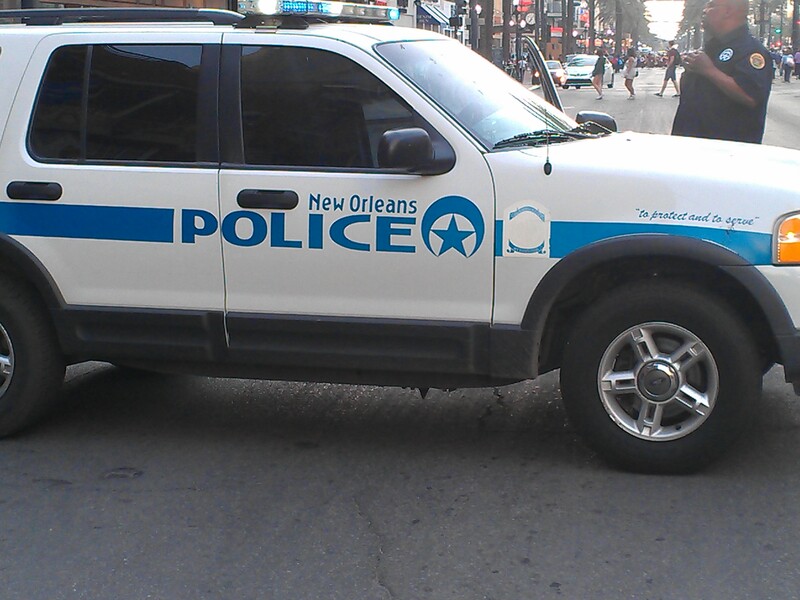 Yes, readers, they blocked off Canal St. for us. We were amazed. We all strutted down the street to the river boat dock. The most fun part of this experience was seeing the looks on the faces of the people standing on the sidewalks. They obviously thought we were all “somebody” as they took pictures and videos of our parade. This had to be the highlight of our trip. 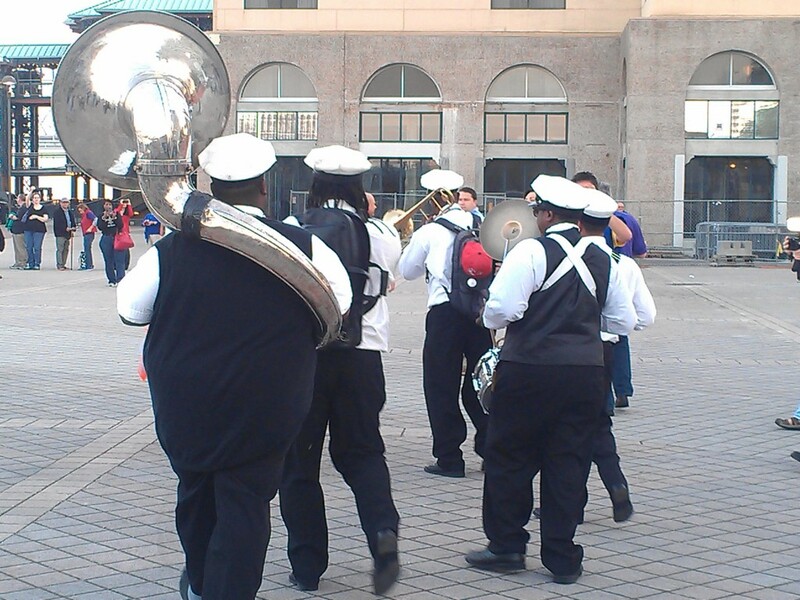 We ended up at the RiverWalk (which is apparently going to reopen soon) and the band played some more. More entertainment from the leader of our parade. 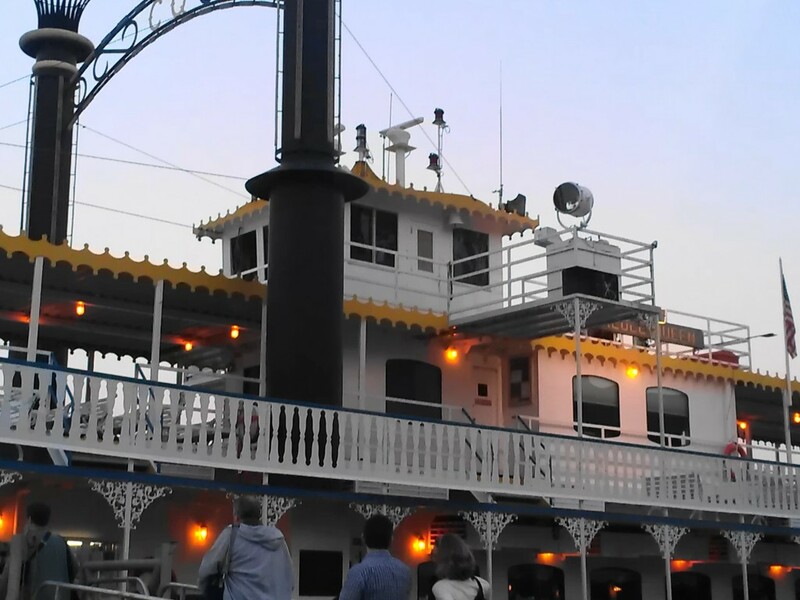 Then it was time to board our river boat for our dinner cruise. We had really a delicious dinner on board. I was expecting the typical banquet type food but the red beans and rice I had was even better than what I had found earlier in the day at the French Market. We had a fabulous time. The walk back to the hotel (although sans a band) was just as exciting as many of the revelers were just getting started and heading out to Bourbon St. 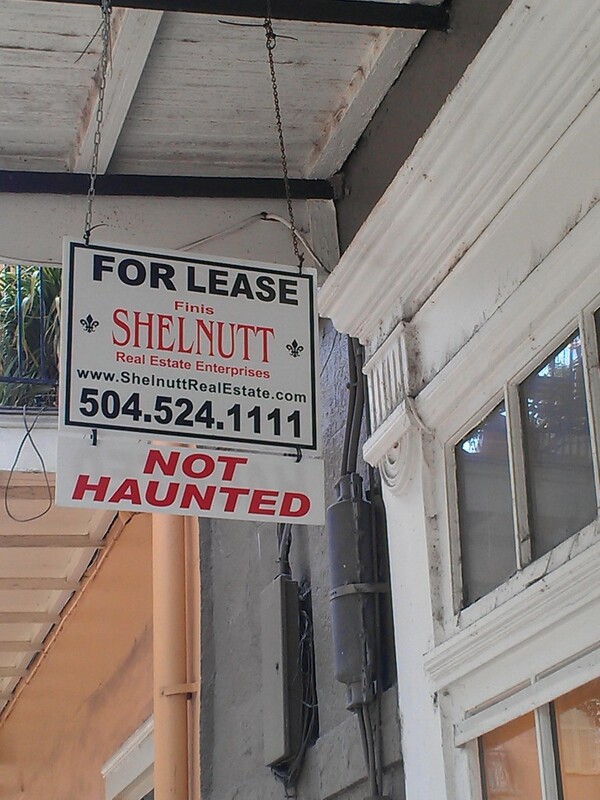 I lied….this is not the last NOLA post. I have a brief wrap up planned…just a little more lagniappe for ya’. I was bummed when I read that this was the last one, so I’m glad you’ll be sharing one more (and hopefully we can convince you for a couple others?). Lagniappe. I can’t spell the word correctly (I had to try four times before my fingers typed it right) so I’m not sure that I’ll remember to say it properly, but it’s an awesome word. Thanks. There will at least be one more. :). I’m not sure I’m pronouncing it correctly either, even with Twain’s help. Hello stranger (as in I’ve been the stranger). Thanks for the vaca in NO, I was all dreamy reading all your posts (decided to just do a collective comment here). What a fun trip, I love the museum pics and want to go. The Dutch couple made me smile…very Europeon, why don’t we loosen up, huh? Thats why I liked Europe so much, my kind of people. Well, it’s not like you have anything else going on! How’s the cafe????? Yep, we all need to go with the flow more and we all need to work lagniappe into at least one conversation this week. I have been enjoying the photos and tour, love the travel posts! I would have pronounced it that way too if not for Twain. According to wiki it’s: ˈlænjæp/ lan-yap. Thanks, Tina. What an amazing trip! 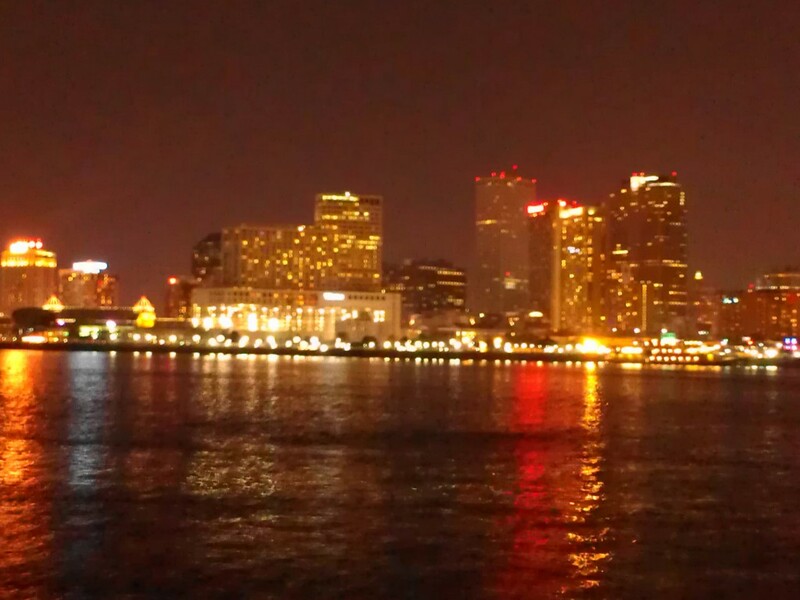 It’s been a long time since I’ve been to New Orleans and I’d love to go back! It is a great city full of great people. I love that neon tye dye shirt! Looks like a great trip, thanks for taking us with you! What about that neon hair? really wish I could share the real reason I took that picture but it would really get lost in translation…. Thanks for sharing all these beautiful photos of this place. I felt like I was there too! Not at all. There are so many in NOLA. In fact, we saw at least two on the ride in from the airport. I would love to take a guided tour of one. We snuck in a bit on one at Lafayette for a few minutes, long enough to hear that there were 50+ family members buried in one of these small crypts. I’m enjoying the heck out of this New Orleans posts!!! I love walking through it’s cemeteries! Great pictures! Very impressive “strut” down to the River Boat, Deb. You “guys” must have felt like quite the celebrities:) You really have whet our whistles with the core of New Orleans life. It’s hard to believe you were visiting. You seem to feel so comfortable. I’m sure a lot had to do with the city itself and the wonderful people. Thank you so much for sharing all the magic, Deb. Wonderful!